Once upon a time a man called Kevin Toms. Some of you (probably those over the age of 35) will have known his product very well indeed. To others the name will mean nothing, but I bet if you a) Own a PC, PSP, Playstation, X-Box or Wii, b) Love football and c) Do not have a demanding wife/partner you will have heard of Championship Manager. Probably only rivalled by redtube.com as the most fun you can have on your own with a PC, Championship Manager gives us all an opportunity to be Sir Alex Ferguson, Jose Mourinho or Gianfranco Zola (unfortunately the “alleged” nocturnal activities of a certain Portsmouth manager cannot be re-created in the current versions of the game), starting with the lowest of the lows and rising to the top. My record was taking Grays Athletic to the Champions League final in my 27 year managerial history on the game. So who is this Kevin, and what relevance does it have on today’s post? Well, Kevin Tombs developed the first every football manager simulation game for the ZX Spectrums back in the very early 1980’s. In the game everyone the opportunity to manager a team, and watch the game unfold in pure two dimensional unadulted by advertising green graphics. Want to see what kept us in our bedrooms for so long at the time without a staple through their naval? Well you can still play a version of the game by clicking here. So where am I going with this one? Simple – Aveley. Who or where you may ask! Aveley is essentially a large town, or small village just the other side of the Queen Elizabeth Bridge. Heard of Thurrock? Well its near there. It is in fact about a mile and a half from the home of Thurrock FC, although technically they actually play in Purfleet. Aveley FC are in the Isthmian Premier League, one level below the Blue Square North/South or “Step 3” for those like me in the know. And tonight Matthew they were playing in the Isthmian Cup, aka The Championship Manager Cup, at the quarter final stage no less against another team from the Essex bordering Thames Estuary, Canvey Island. 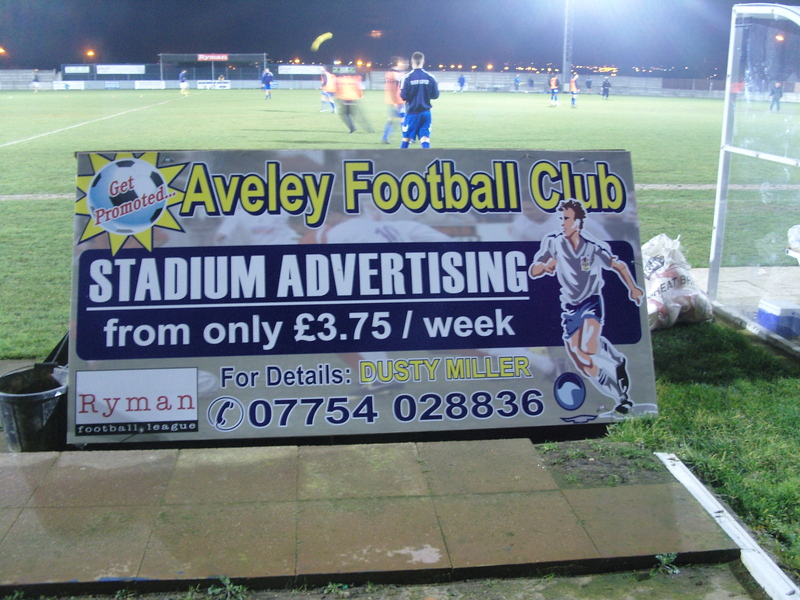 Aveley FC, or the “Millers” have been playing at this level since 1973 when they were first elected to the Isthmian league. They had bounced up and down the various levels but could point to the fact that they were Rymans League 1 North champions last season to get into the Premier League where they had more than held their own this season. They actually won the title in dramatic circumstances, beating champions elect East Thurrock United 3-2 on the last day. But this was cup football, and the form book could go out of the window. The Millers had actually won this competition before, some twenty years ago when it was known as the AC Delco Cup when they beat St Albans City 3-0. There was also the small issue of a FA Cup qualifying round defeat to Canvey Island from 2002 to avenge, and avenge they planned to do. So why such excitement about a Monday night game in tidal Essex? Well, for one it was a rare midweek outing for me which was actually on! And that despite the Fuller 5 A Side Arena (aka the back garden) still being under inches of water, and secondly because you rarely get an opportunity to turn up at a game with your Playstation controller to influence the game – or that is what I thought we were supposed to do and told Dagenham Dan to bring his along too. Lolly, our official photographer was also allowed a night off from her 11+ revision, making the TBIR party a significant proportion of the attendance. Well, based on the previous round when the local derby with AFC Hornchurch had attracted just 104 then we wouldn’t be too far from the truth. The Isthmian league had been decimated by the weather since Christmas and many teams had lost five or six games due to postponements so you could see why this cup is a bit of a distraction – in fact in the previous round Concord Rangers and Tonbridge had failed to fulfil their fixtures for various reasons. But this was a local derby and passions would be at the fore right?Aveley 2 Canvey Island 1 – The Mill Field – Monday 1st March 2010 Signs were good when we turned up. The car park was full and the pot hole filled access road lined with cars. Perhaps we had vastly underestimated the lure of this game. We paid our £10 for entry and a programme and was amazed to see that the crowd consisted of us and three others. We headed for the tea bar – a magnificent structure in the corner of the ground complete with a retro neon sign and a theme park style queueing system. They were rushed off their feet but not by us, but by the massed crowds of females in the adjacent hall. Stripper night? No better than that – for this is Essex. It was “dancing around your handbag” lessons! (only joking! The room was packed though). The Dagenham crew arrives and immediately doubled the attendance and we secured a spot in front of the main stand. A late rush of spectators took the attendance up past the fifty mark, but still in the “safe” area of my bet with Dan with was “less than 73”. The ground is a really strange affair. I know this is only Rymans League, and this is the highest level the club have played at, but it appears to have shrunk over the years. On the far side, beyond the Rymans Stand (Scaffolding and tin roof with a Rymans sign on) is another football pitch size bit of land sitting within the grounds outer wall. At the north end there is another large track of land, and the pitch itself is flanked by yards of empty grass. Why not move the boundary walls in then? or does the ground double up as the home of the Essex Knights Polo team in the Summer? 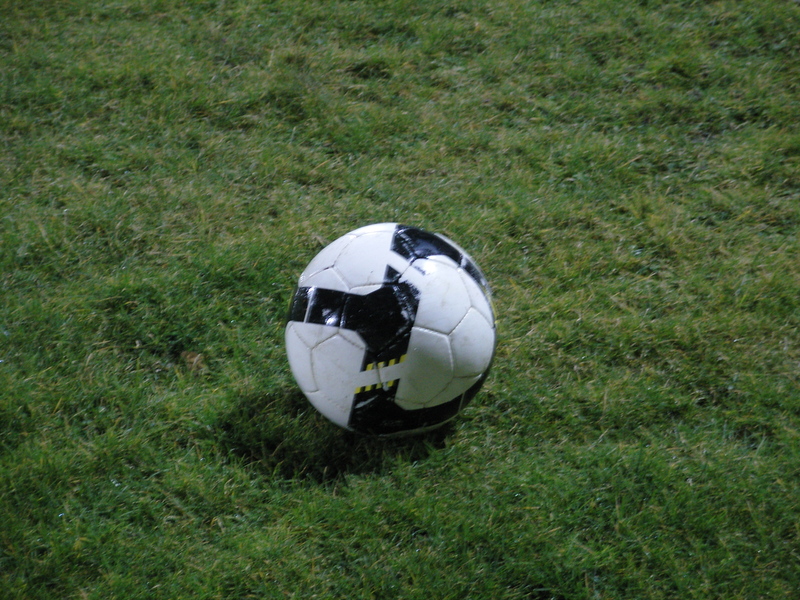 The game was due to be played to a finish, although with the temperature dropping most of us hoped that extra time and penalties would not be needed. Aveley lined up with Junior Dadson in the starting line up, and an A Daddy on the bench – quite a fatherly duo if ever I saw one. And Canvey had their own JEDward and Jon Edwards probably heard that for the first time. The first half was dominated by the signing efforts of the Aveley Crew in the main stand, rolling out their song book including a version of Bubbles which had the line “Just like Thurrock, they fade and die”. Classic stuff but they soon grew tired of not getting a response from the Canvey Island seven behind the goal and disappeared off to the waste land behind the north end for a game of footie themselves. The match was a hard fought affair, and right up until the 88th minute seemed destined for extra time which I do not think anyone in the ground wanted. Alls well that ends well as through Lolly and Liam’s controllers they orchestrated a winner as Sherwin Stanley scored the goal that sent the home team through, and the crowd home to their warm cars. So Aveley became the first team to reach the semi-finals. They would have to wait a week or two before the full line up was known, but with most of the Ryman’s Premier teams already out they must fancy their chances of winning the cup for a second time. A fifteen minute drive home ensued and before the clock struck ten I was tucked up in bed with CMF, who was having the most amount of fun you could have with a pc on your own in a bedroom. While the cat’s away and all that! About The Mill FieldFor those of you who love the bygone era of old football stadiums then you will love the panorama of the ground when you stand on the east side of the ground. The old main stand (not that there is a new one, it is just old), sits high on the terrace, with a fenced off paddock in front and has smart blue seats with AFC in white picked out. Views are good from here. As for the rest of the ground it is pretty basic to say the least. two steps of terrace around the rest, with a small scaffolding constructed cover on the far side (The Rymans stand). Behind the north goal it appears that construction has started on a very small permanent structure. What is apparent though is the size of the ground – there is masses of room behind the east and north stands, and the pitch itself is set back by 10 yards on both sides from the crowd hardly adding any atmosphere to proceedings. How to get to Mill FieldFrom A13: Follow A13 until junction with A1306. Turn left (Rainham / Wennington) then immediately turn right into Sandy Lane (B1335) to Aveley. At next roundabout turn right into Mill Road, the entrance to the ground is 300 yards on the left (after St. Paul’s Close). From M25, Northbound (anti-clockwise) Exit Motorway at Junction 31 (A1306, first junction from Dartford Tunnel). At the roundabout follow the directions for the Aveley turn off and head up Ship Lane. At the mini-roundabout (High Street) turn left. At the next mini-roundabout turn right into Mill Road. The entrance to the ground is 600 yards on the right (after St. Michael’s Close). From M25, Southbound (clockwise) Exit at Junction 30 and turn right (A13 London). At the next junction (A1306) follow signs to Rainham / Wennington. Then turn immediately right into Sandy Lane (B1335) to Aveley. At next roundabout turn right into Mill Road, the entrance to the ground is 300 yards on the left (after St. Paul’s Close). There is a car park at the ground although its not very big. There is plenty of room in the surrounding roads though. Bus 372 passes the ground. The 372 service runs from Hornchurch to Lakeside. A rail connection with this bus is available at Elm Park (District Line), the journey time is 19 minutes to Aveley. You can also pick up the 372 from RAINHAM Station (c2c LONDON FENCHURCH STREET (dep xx05 & xx35) to GRAYS).Google Maps referenceGetting a ticket for Mill FieldDespite the small capacity for Mill Field, 99% of games are pay on the door. It is £9 for Adults, £1 for children and programmes are a £1. Once inside you can use the fantastic tea bar with its neon sign and theme park style queuing system. The bar is actually located outside the turnstiles though.